Got a classy Mercedes-Benz and want to elevate it some more? These super high powered LED License Plate Lights do your prized Mercedes justice and take it to a whole new level of class. These LED lights are 3-4 times brighter than their stock counterparts giving you a beautiful xenon white shine to make you the envy of everyone wherever you go. OEM replacement LED license plate lamps are a simple way to give your car a neat upgrade without too much effort needed on your part. The LED lights pretty much do all of the work for you. 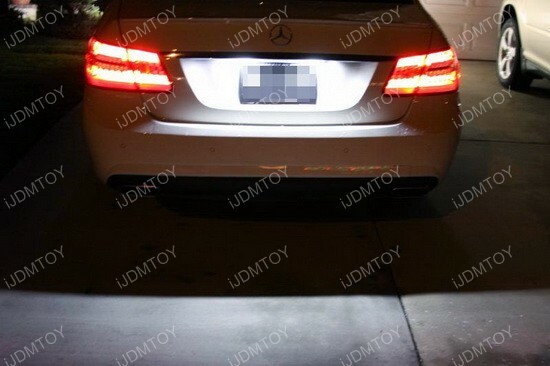 The owner of this 2010 Mercedes E350 did a fantastic job in choosing these LED license plate lamps and as you can see, the entire rear end of the Mercedes is lit up in unison. 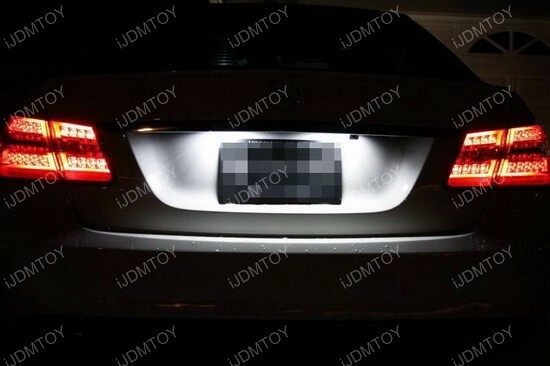 The LED License Plate Lamps blend in seamlessly with the taillights in a very cohesive manner and looks very elegant. The LED lights are so bright and smooth looking that it’s almost calming, yet still looks pretty bold. It’s great that this upgrade is a direct replacement because you don’t have to worry about any unnecessary extra work that may occur during installation. There are built-in CAN-bus load resistors designed specifically for this product so you don’t have to worry about any error messages. Just make sure that your stock lamp is still that yellowish halogen bulb and not the new Mercedes’ OEM LED lights. You may also have to remove the trunk trim liner to get better access for installation. LED License Plate Lamps are a surefire way to upgrade your ride without putting in a whole lot of work, that’s for sure. This entry was posted in - LED & HID Updates, Mercedes Benz and tagged E Class, european cars, iJDMTOY, LED, License Plate, license plate lights, Luxury Cars, Mercedes, Mercedes Benz, Mercedes Benz E Class, Mercedes E Class by Shari. Bookmark the permalink.